After the events of the Adventure Time™ series finale, Marceline and Simon have finally reunited! 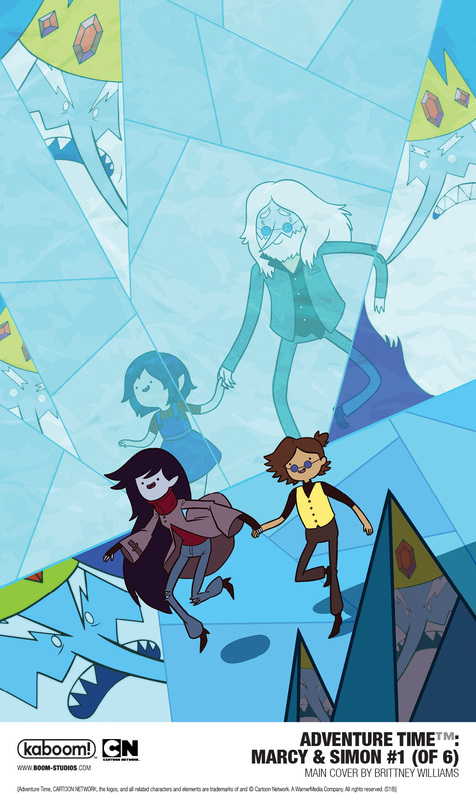 Now together, Simon asks Marceline for help in making amends for his time as Ice King, which leads them, Finn, and Jake on an adventure with so many twists and turns, even our skilled heroes have a hard time keeping up! A modern day fable, the Emmy® Award–winning animated series Adventure Time™ has become a global success since its premiere in 2010, attracting adult and kid viewers in their millions over the course of 10 seasons. It follows unlikely heroes Finn and Jake, buddies who traverse the mystical Land of Ooo and encounter its colorful inhabitants. The best of friends, our heroes always find themselves in the middle of heart-pounding escapades. Finn, a silly kid with an awesome hat and Jake, a brassy dog with a big kind heart, depend on each other through thick and thin. Adventure Time is created by Pendleton Ward and produced at Cartoon Network Studios. BOOM! Studios has been publishing the New York Times bestselling Adventure Time™ comic books and graphic novels through their KaBOOM! imprint for middle grade readers since 2012 and been honored with Eisner, Harvey, and Diamond Gem Awards for the series. ADVENTURE TIME: MARCY & SIMON #1 is Olson’s third writing contribution to the expanded literary world of the eponymous franchise, previously collaborating with her father Martin Olson (the voice of “Hunson Abadeer”) on The Adventure Time™ Encyclopedia. The two also co-authored Adventure Time™: The Enchiridion & Marcy’s Super Secret Scrapbook, written from a first person perspective through Marceline’s diary entries about when she and Simon first met. Both Adventure Time™books, published in partnership between Abrams and Cartoon Network, are available now everywhere books are sold. ADVENTURE TIME: MARCY & SIMON #1 features a main cover by Brittney Williams (Goldie Vance), along with variant covers by Lisa Dubois (Rugrats), Sofie Drozdova (Regular Show) and Ashley Morales. 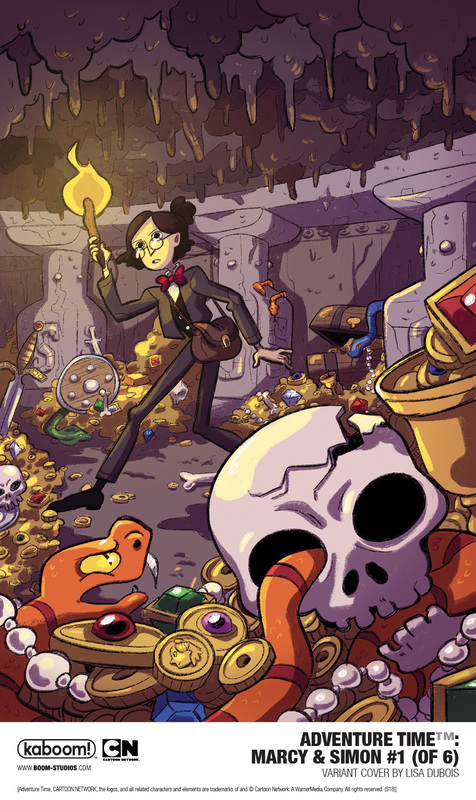 ADVENTURE TIME: MARCY & SIMON is the latest release from BOOM! Studios’ award-winning KaBOOM! imprint, home to comics for middle grade and younger readers including licensed series such as Over The Garden Wall, Regular Show, Steven Universe, Peanuts, and Garfield, along with original series like Mega Princess by Kelly Thompson and Brianne Drouhard, Bodie Troll by Jay Fosgitt, Ruinworld by Derek Laufman, and The Deep by Tom Taylor and James Brouwer. 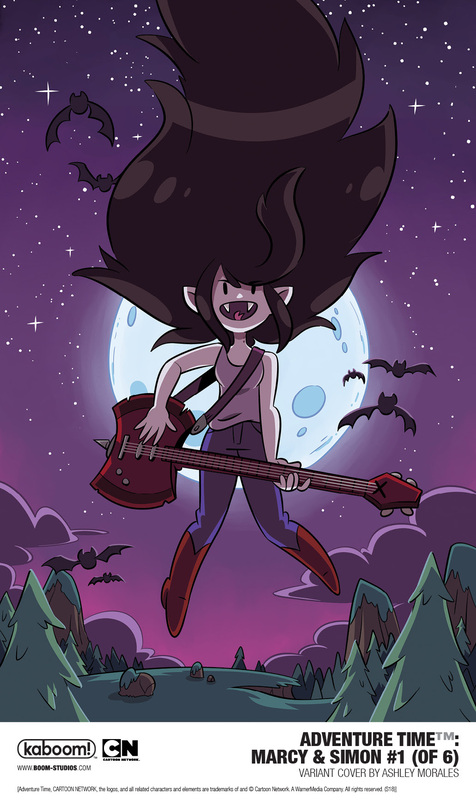 Print copies of ADVENTURE TIME™: MARCY & SIMON #1 will be available on January 16th at local comic book shops (use comicshoplocator.com to find the one nearest you), or at the BOOM! Studios webstore. Digital copies can be purchased from content providers like comiXology, iBooks, Google Play, and the BOOM! Studios app. 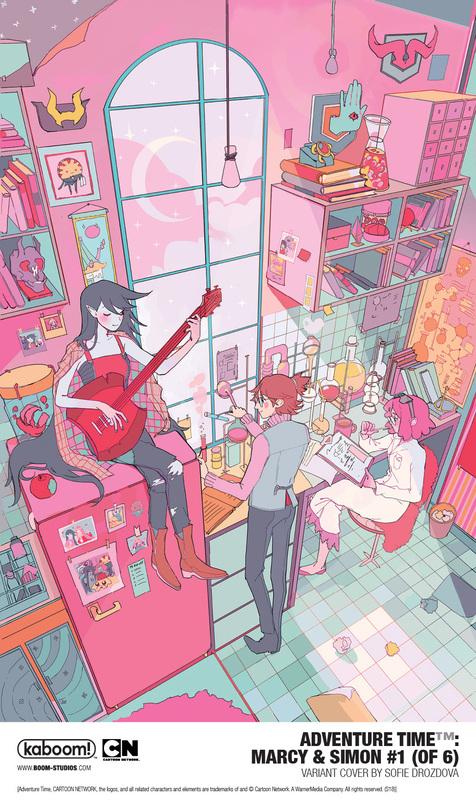 For continuing news on ADVENTURE TIME™: MARCY & SIMON and more from BOOM! Studios, stay tuned to www.boom-studios.com and follow @boomstudios on Twitter.